Adding a bird bath to your landscape creates a focal point while helping with wildlife conservation. A bird bath offers a water source for birds or can become a puddle for butterflies with a few additions. Creating an attractive landscape around the bird bath can attract wildlife while beautifying your yard. Place the bird bath in a spot near trees and bushes to make it more accessible to wild birds. A sunny location will give you a larger variety of plant possibilities around the bird bath. A location that provides a combination of sun and partial shade is an ideal choice. Set the bird bath on a paving stone. This will provide stability and a flat surface. Create a pathway around the bird bath. This will allow you to get close enough to the bird bath to clean it. Place paving stones in an arrangement around the bird bath. If you prefer to have pavers level with the ground, dig out the shape of the paving stone with a shovel, level the dirt, then place the paver in the ground. Add dirt as needed to make the stone level. Add plants near the bird bath. To deter predators, a clear area of about 10 feet in diameter should be around a bird bath. This allows birds to make use of the water without sneaking up on them. Add a variety of your favorite plants that will provide food and shelter for wild birds. Sunflowers provide seeds. A lilac bush provides shelter. Choose plants appropriate to the sun exposure near the bird bath. Add feeding stations around the bird bath. Use tall shepherd's hooks to hang bird feeders but position them away from the bird bath. Feeders should not be close enough for dropped seeds to fall into the bird bath. Create a combination of feeding stations for a variety of birds that may visit--hummingbirds, goldfinches, cardinals and others. Add a bench or seat at least 10 to 20 feet away from the bird bath. The distance will allow you to observe visiting birds without scaring them away. 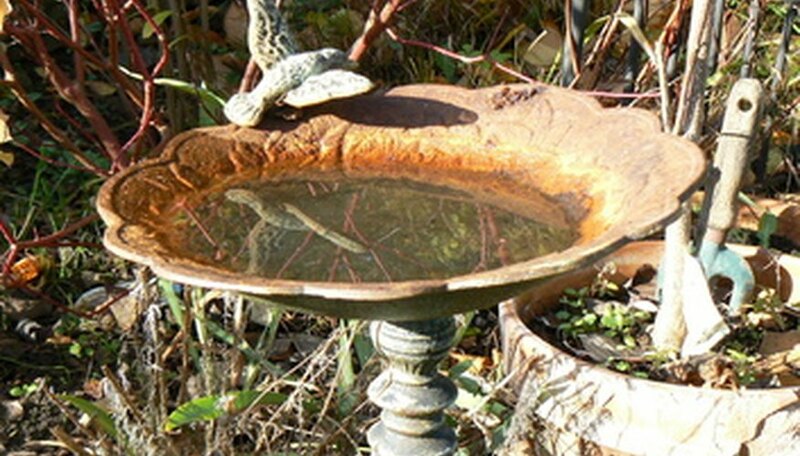 Add a rock in the center of the bird bath to give birds something to perch on. Add fresh water to the bird bath daily. Wash the bird bath every three or four days. Disinfect it with bleach once or twice each year. The water level should not be more than 2 inches deep. Never add chemicals to the water.